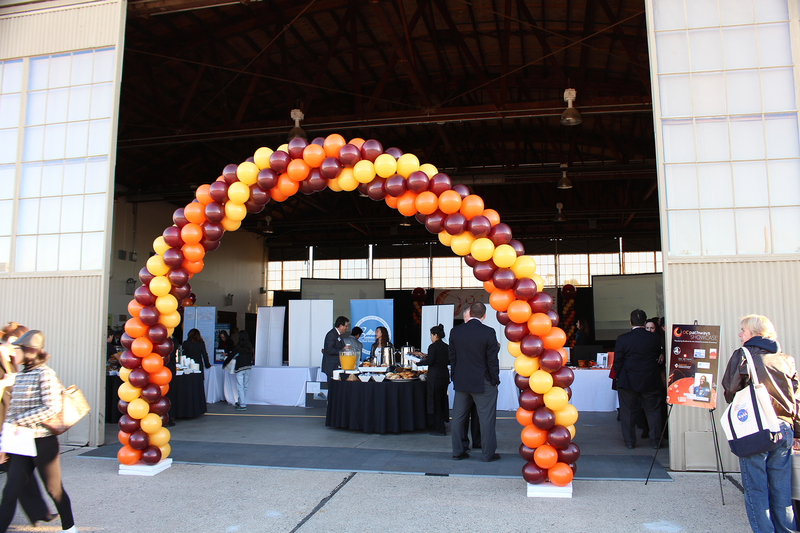 On a cool December morning, in a historic airplane hangar at the Orange County Great Park, some of the region’s top educators and business leaders gathered for a very special birthday party. OC Pathways, an initiative that brings together schools, colleges and businesses to create new career paths in targeted industry sectors, was celebrating its first year — and what a year it’s been. Over the past 12 months, more than 8,600 high school students have enrolled in OC Pathways programs, receiving career preparation in the fields of health care, biotechnology, engineering, advanced manufacturing, information technology and digital media. In our community colleges, more than 12,500 students have participated in OC Pathways coursework, earning roughly 600 certificates and 85 degrees. Led by the Orange County Department of Education and Saddleback College, OC Pathways was launched in 2014 through a California Department of Education grant. Along with its efforts to partner schools and colleges with industry leaders, the project creates work-based learning opportunities for students — these include internships and mentorship — and empowers educators with innovative teaching strategies. In just the first year of this initiative, more than 2,500 students participated in one or more work-based learning experiences, and we have seen a 13 percent increase in the number of articulation agreements that allow high school students to receive community college credit for taking career technical education courses. Moreover, OC Pathways has established 53 additional businesses partnerships that will help strengthen the 21st-century workforce. On Dec. 2, the leaders of many of these businesses were among the 300 or so who gathered in the Great Park’s Hangar 244 for a morning showcase that featured incredible displays from local schools, colleges and businesses, as well as video profiles of students who are on successful career tracks thanks to OC Pathways. NASA astronaut Leland Melvin, who made two trips aboard the Space Shuttle Atlantis, was riveting as our keynote speaker at the end. I was also honored to say a few words, joining Saddleback College President Dr. Tod A. Burnett, OC STEM Executive Director Dr. Linda Christopher, Orange County United Way president and CEO Max Gardner, and four very impressive high school and college students. Thanks to the unparalleled levels of collaboration between Orange County’s secondary and postsecondary partners, OC Pathways has already racked up more achievements than can be listed in this column, and we’re just getting started. Just think of what can be accomplished in year two. You can learn more about OC Pathways’ efforts to promote college and career success by visiting the OC Pathways website. To find out how you can get involved, click here. Leland Melvin’s pathway to a career as a NASA astronaut took a highly unusual detour through the National Football League. But first came a high school football game with a college scholarship at stake. With his team down late, Melvin couldn’t hold on to a potential touchdown pass in front of a homecoming crowd and a University of Richmond scout. But the story doesn’t end there. His coach responded by calling the same play again. Melvin caught the second ball, securing a victory and the Richmond scholarship. 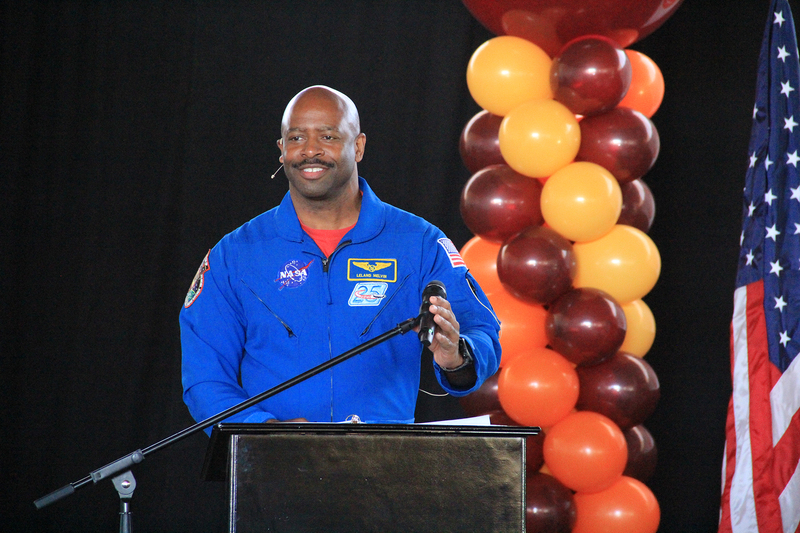 Melvin, who voyaged to the International Space Station in 2008 and 2009, was the keynote speaker at the inaugural OC Pathways Showcase, held in Hangar 244 at the Orange County Great Park in Irvine. The event, featuring innovative displays from local schools, colleges and businesses, drew about 300 educators and industry leaders to celebrate the college and career partnerships established during the first year of OC Pathways. As we’ve previously mentioned here, OC Pathways is an initiative that brings together schools and businesses to create sequenced coursework that combines rigorous academics with career preparation. It also offers work-based learning opportunities for students and empowers educators with 21st-century learning strategies. Led by OCDE and Saddleback College, the program was established in 2014 through a grant from the California Department of Education. 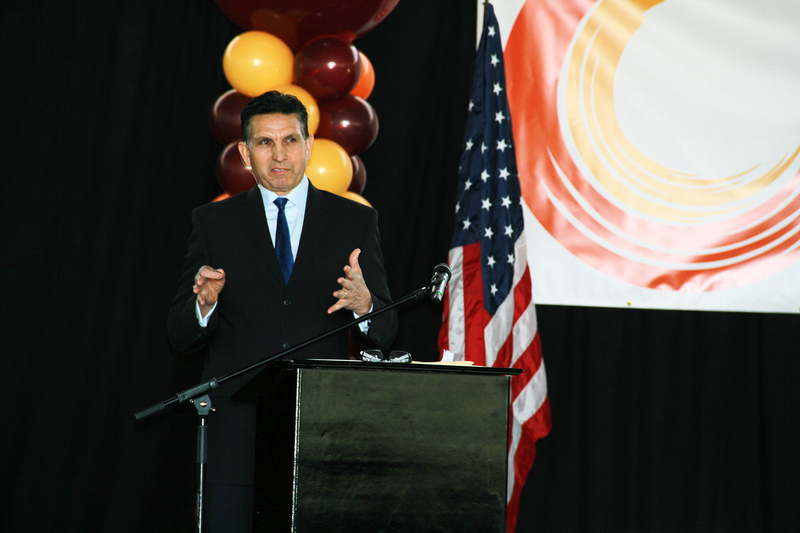 “I believe that we can attribute these initial accomplishments, and the great accomplishments ahead, to the unparalleled levels of collaboration between Orange County secondary and postsecondary partners that have been forged by OC Pathways,” Orange County Superintendent of Schools Dr. Al Mijares said at Wednesday’s Showcase. Saddleback College President Dr. Tod A. Burnett also delivered remarks, as did OC STEM Executive Director Dr. Linda Christopher and Max Gardner, president and CEO of the Orange County United Way. And of course there was Melvin, who spoke about his own personal pathway, which led from Lynchburg, Virginia to the NFL — he had brief stints with the Detroit Lions and Dallas Cowboys — to the Space Shuttle Atlantis, which twice transported him to the final frontier and back. Not many can boast professional football and space travel on their resumes. But long before he did either he was simply a curious kid helping his dad convert a bread truck into a family camper — and learning important lessons about what is possible. Melvin said it wasn’t until he and his father rewired the vehicle, installed bunk beds and painted the exterior that he could envision the truck as a serviceable motorhome. The high school and college students in attendance appeared ready to launch their careers right away. 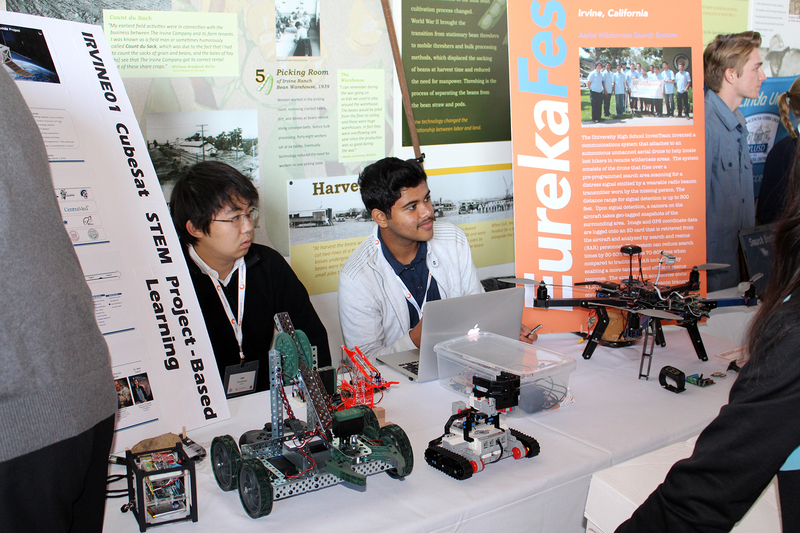 Many displayed their technical achievements in STEM fields, lining the hangar with impressive exhibits, including handmade aerial drones and experiments that use data from real satellites. Toward the end of the showcase, four students took the stage to field questions about their career paths from Dr. Mijares and Dr. Burnett, including Dana Hills High senior Stephen Tedena and Saddleback College student Leah Jamison, whose stories are documented in brief videos here and here; and Century High senior Rosa Yanes and Saddleback High senior Denise Garcia, who participated in an exclusive summer internship at NASA’s Jet Propulsion Laboratory. We’d encourage you to check out these videos to see how OC Pathways is specifically impacting local students. And you can learn more about the initiative by visiting the OC Pathways website. A limited number of seats are still available for an upcoming showcase to celebrate the first year of OC Pathways, an initiative that’s paving the way to college and career success and strengthening the 21st-century workforce. 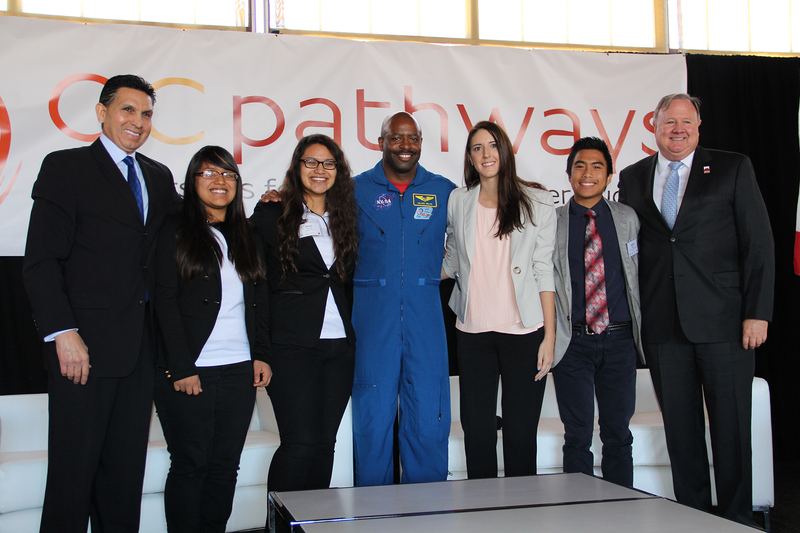 Open to educators and industry leaders, the inaugural OC Pathways Showcase on Dec. 2 will feature innovative displays from local schools, colleges and businesses, as well as a keynote address from NASA astronaut Leland Melvin. “Equipping Students for the Global Innovation Economy” is the theme of the event, which will be held from 7:30 to 10 a.m. inside Hangar 244 at the Orange County Great Park in Irvine. Additional speakers are set to include Orange County Superintendent of Schools Dr. Al Mijares, Saddleback College President Dr. Tod A. Burnett, OC STEM Executive Director Dr. Linda Christopher, and Max Gardner, president and CEO of the Orange County United Way. Led by OCDE and Saddleback College, OC Pathways was initiated through a 2014 grant from the California Department of Education. The project connects educators with industry partners to align coursework so that it combines rigorous academics with career preparation. OC Pathways also creates work-based learning opportunities for students and empowers educators with 21st-century learning strategies. If you’d like to attend the showcase, click here, or on the graphic above. If you wish to learn more about OC Pathways, visit www.OCPathways.com. With new technologies emerging at an unprecedented rate, it should come as no surprise that computer science jobs are surging. According to the U.S. Bureau of Labor Statistics, by 2020 there will be a million more computer science positions than graduates qualified to fill them. At the same time, a recent Gallup report commissioned by Google suggests that educational opportunities in this field have been inconsistent, and entrenched stereotypes might be discouraging girls and some minority groups from participating. So what can be done at the local level? We can start by raising awareness and promoting engaging learning experiences like Hour of Code. For those who haven’t heard of this campaign, the Hour of Code offers a global introduction to computer science with one simple call to action: It asks every single student and as many adults as possible to write code for one hour during the week of Dec. 7. Code is the backend text that programmers write to tell computers what to do. Writing code may sound intimidating, but it isn’t as daunting or arcane as many believe — and that’s really the point. The Hour of Code website offers self-guided activities and features tutorials, a how-to guide and options for all levels of experience and age, from kindergarten and up. Sure enough, computer science isn’t just for those who will pursue computing jobs; it serves as a foundation for college and career readiness by promoting problem-solving skills, logic and creativity. That is why I’m eager to personally take part by writing my first line of code in December, and I would encourage teachers, students, administrators, parents and support staff throughout Orange County to do the same. Last year, Apple Stores around the world hosted an Hour of Code event, and many districts and schools participated locally. This year the Orange County Department of Education is pursuing even greater numbers to contribute to the largest learning event in history. You can help by participating, spreading the word, hosting an hour of coding or encouraging your local school to sign up. By demonstrating that anyone can learn the basics of computer science, we open doors and shatter barriers. More important, we empower students to write their own codes and scripts for college and career readiness and success. If you’d like more information on how to get involved with the Hour of Code campaign at the local level, contact OCDE Instructional Services Coordinator Alisa McCord at amccord@ocde.us or 714-327-1063. Even the smallest gestures can make a huge impact. A recent initiative in Anaheim proved as much by challenging local students to complete one million caring deeds, from picking up trash to welcoming a new student. The “Million Acts of Kindness” campaign kicked off in 2013 with the goal of elevating the culture of an entire city by leveraging the goodwill of its youngest citizens — in this case the students of the Anaheim City School District, under the leadership of its superintendent, Dr. Linda Wagner. By October 2014, their target was met, but committing acts of kindness can be a tough habit to break. Anaheim’s successful experiment presents lessons for the rest of Orange County. As our schools charge forward with new educational standards and funding models, we cannot lose sight of the fact that a 21st-century education must also be a values-based education. Beyond teaching “the four Cs” of communication, collaboration, critical thinking and creativity, we have a moral obligation to promote a fifth C — character. What do we mean by character? Think of it as encompassing basic human values such as honesty, kindness, respect and compassion. These qualities are at the heart of morally responsible and productive citizens, which is why it is so critical for educators to teach and model positive behaviors. It is heartening that other school districts are looking at replicating Anaheim’s success by starting their own projects to build a culture of kindness that extends beyond the classroom. Meanwhile, I also envision opportunities to scale up. Just think of the impact that we could make if we committed to spreading acts of kindness throughout Orange County. And what if we didn’t stop at a million? Orange County Superintendent of Schools Dr. Al Mijares has released a new report assessing OCDE’s progress toward meeting its eight strategic goals. “Measuring Up: Strategic Priorities and Key Performance Indicators” can be accessed by clicking here, or on the graphic below. Last year, the Orange County Department of Education unveiled an ambitious vision, stating that “Orange County students will lead the nation in college and career readiness and success.” Along with that vision, the department developed a five-year plan that spelled out eight strategic priorities, along with desired outcomes and key performance indicators. The idea is to use specific metrics to track the progress of OCDE’s programs and services, as well as the overall performance of Orange County students. This data will ultimately be included in comprehensive reports that will be available to the public. In the meantime, Superintendent Mijares and OCDE have issued this more concise and user-friendly snapshot, which offers some of the top statistics and info-graphics for each of the eight priorities. The report highlights some promising signs, including the fact that O.C. students posted higher average scores than California on new English and math assessments aligned with the state standards. But the data also identify areas for improvement. Using this information, OCDE will be able to strategically invest its resources to enhance services that benefit students, parents and the community. We’d encourage you to take a look at the report, and visit the OCDE website to check out the five-year strategic plan and learn more about the steps the department is taking to ensure students graduate from high school with the competencies needed to thrive in the 21st century. In September, the state released the first batch of new assessment scores that revealed how well students are learning California’s English and math instructional standards. The result? Orange County students had outpaced their state and regional counterparts, both on the English and math portions of the test. That’s good news, yet these inaugural scores also reflect how much more work is needed as we continue our transition to 21st-century learning standards. Indeed, we are witnessing a remarkable transformation for education that’s not unlike the construction of a new highway system; and just like building a highway, some time will be needed to fully calculate the economic benefits. If you’re not familiar with the new California Assessment of Student Performance and Progress, or CAASPP, student scores in English language arts and mathematics are divided into four achievement bands — standard exceeded, standard met, standard nearly met and standard not met. According to data released by the California Department of Education, 53 percent of Orange County students met or exceeded the English standard in 2015, and 45 percent did the same in math. California’s rates were nine points lower in each subject, with 44 percent of students meeting or exceeding the English standard and 34 percent meeting or exceeding the standard in math. It’s worth noting that Orange County students actually performed better on these 2015 assessments — at every comparable grade level — than students in the county who first took the California Standards Tests back in 2002. Drill down a little deeper and you’ll find several local success stories. At Middle College High School in the Santa Ana Unified School District, an astounding 99 percent of 11th-graders met or exceeded the CAASPP standard for English. The Irvine Unified School District posted the highest math scores in the state among districts with 25,000 students or more. And when you combine the number of students who met or nearly met the standards in Orange County, our population posted rates of 76 percent in English and 72 percent in math. California officials have stressed that the new assessments should not be compared with those of previous years, as the tests — and the standards on which they are based — are so fundamentally different from the bubble-in versions that preceded them. Yet these results can and will serve as the baseline for measuring future progress in Orange County and elsewhere throughout the state. Even more important, they’re ensuring teachers and administrators have the information they need to make data-driven instructional decisions in the classroom. In the end, it’s less about state and regional test scores and more about meeting the needs of each student — and ensuring all are equipped with the knowledge and skills required for college and career readiness and success.